We always picture a double header as a day in the sun. It did not start raining until the last 15 minutes of the Sounders game, so that was a plus (no roof). Over to Safeco for the Mariners. The temperature started dropping about halfway through batting practice. 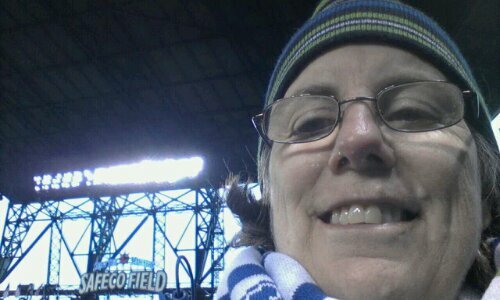 I currently have on long underware, under armour, jeans, long-sleeved t-shirt, Sounders jersey, light winter jacket, Sounders rain jacket, gloves, scarf and hat. The heavy winter coat will be added shortly. And the blanket. I want a good game, and then some hot chocolate with a little something. This entry was posted on April 13, 2013 at 5:34 pm and is filed under Uncategorized. You can follow any responses to this entry through the RSS 2.0 feed. You can skip to the end and leave a response. Pinging is currently not allowed. I don’t envy you–cold, rainy and even hailing here. I’m staying inside my house with the fake fire on. I so wanted a fake fire place with our remodel. Unfortunately I believe it has hit the cutting costs floor. I went to the U-M spring football game on Saturday. There were flurries. LUCKILY I was sitting in one of the posh, relatively new, suites. With food, a real bathroom and warmth!